The world's first nutritionally complete instant ramen. We carefully craft our ramen with 27 vitamins and minerals, more protein than 4oz ribeye steak, all for less than the cost of ordering takeout! Nutritious. Delicious. Fast. Pick three. Cooking is great, but takes a lot of energy to do. Fast food is quick, but doesn't make you feel so great afterwards. If you're already tired or have no time, trying to eat right can be downright draining. 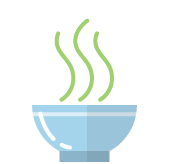 We made Vite Ramen so you can keep your energy levels up with high protein, slurpable nutrition! Rest easy knowing there's no preservatives, deep frying, or mountains of salt in our ramen, and say goodbye to unhealthy, expensive takeout! We're twin brothers who grew up eating instant ramen, but always thought it could be better. We spent hundreds of hours in our tiny college apartment testing recipes and many late nights calculating nutrition to make what would eventually be Vite Ramen! We're a small business that believes that food shouldn't be a race to the bottom, and that wants to make ramen ethically and responsibly: we make all the noodles ourselves in the USA, pay employees a living wage and only use high quality ingredients we'd eat ourselves (because we do)! Vegan Mushroom Shio, Garlic Pork, and Soy Sauce Chicken. Every packet comes fully featured with a savory flavoring sachet, an aromatic dehydrated vegetable blend, a proprietary Noodtrient™ spice pouch, and an omega-3 rich oil pack. It’s also made right here in the USA to make sure that every ingredient and every nutrient is exactly what it’s supposed to be. With 27 grams or more of complete protein in each packet, Vite Ramen has as much protein as 4 oz of steak or 12 oz of tofu! Impossible, you say? Our unique blend of flours includes grains like quinoa to make a robust vegan protein source. The best way to take your vitamins, bar none. Vite Ramen packs a whopping 25% DV or more of every essential vitamin and mineral you need in forms your body can actually use. All in a single pack of instant ramen. When chefs and nutritionists work together, great things happen. Our team of chefs have experience in Michelin Star restaurants, and our UC Davis Clinical Nutrition alumni have partnered with Registered Dietitian Professor Joan Frank, M.S. R.D. to bring you the best of both worlds. In a perfect world, we can eat whatever we want and be completely healthy. 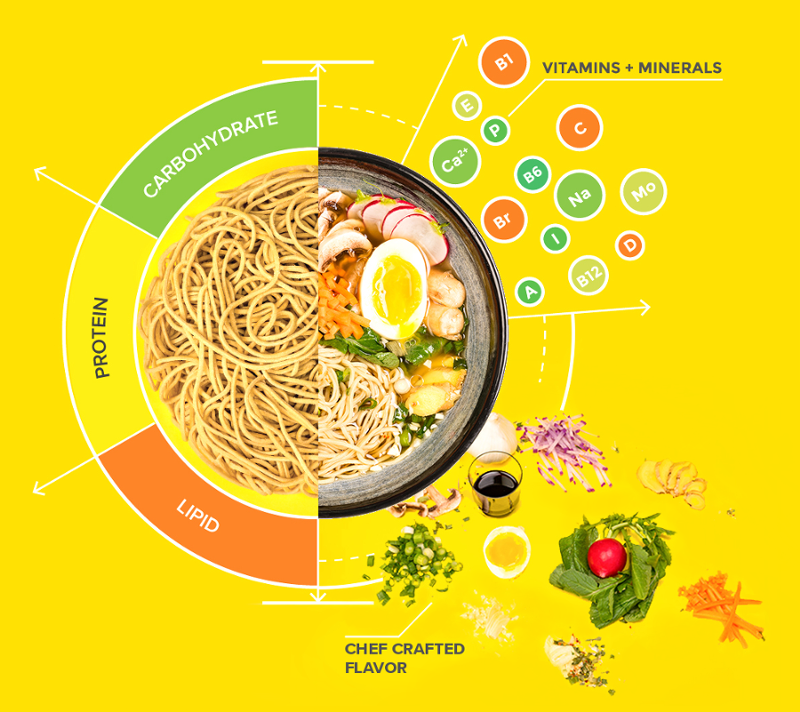 Vite Ramen is the first step towards that world, where anything we eat can be nutritious, from balanced macronutrient content to heart healthy fiber. Vite Ramen has 3 flavors, with delicious, comforting broths that you can reach for during cold winter days, a bad hangover, or just when you want to feel warm and cozy. Our team of chefs crafted these broths to be just as good the first time as the hundredth. Time stands still for no one. Sometimes, you really need something quick and easy. Vite Ramen is easily made in four quick minutes with boiling water, and needs no refrigeration, so you can stock up and always be ready whenever you need that fast meal. I'm READY. SEND ME NOODS! Free ramen, discounts, how-to guides and more! Subscribe to our email list stay up to date on our nood news, stay updated on special dates and some very special deals and opportunities! Your privacy is important to us, and your email will never be shared with anyone. That would make us very sad. Whoohoo! 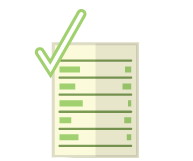 Thanks for signing up and we’ll get in touch soon! We’re a bunch of nerds who like esports, anime, gaming, TCGs, parkour, cooking, and all kinds of other stuff! Vite Kitchens was started by twin brothers, Tim and Tom Zheng. 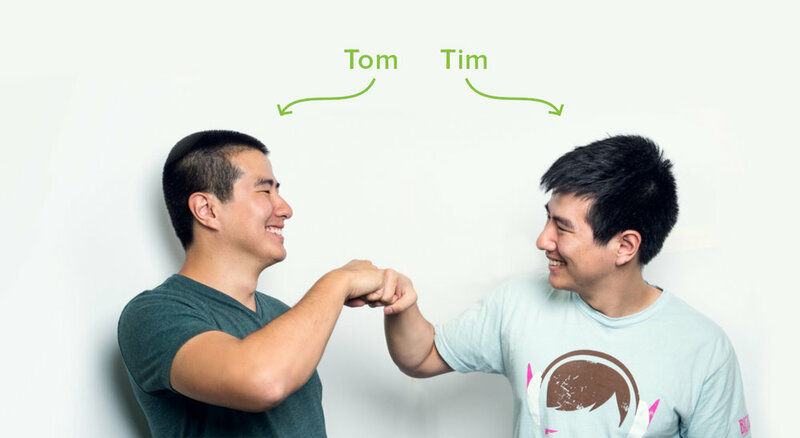 Tim cooked in a Michelin Star restaurant after culinary school, then graduated with a degree in Managerial Economics from UC Davis, while Tom graduated with a degree in Clinical Nutrition from UC Davis. Our dream is to make delicious, nutritious food for everybody, and do some silly (but fun) things on the side, like making unreasonably large pots of noodles or handmaking big plinko boards for cons. 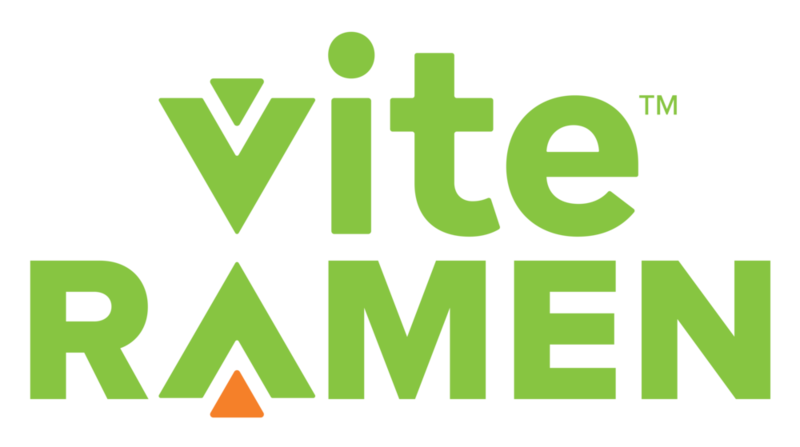 Vite Kitchens is all about communication, transparency, and just generally trying to be good people. We’re a startup so we're still working out the kinks, but we will always listen to everyone’s suggestions, complaints, and strive to improve ourselves any way we can. Feel free to contact us on Twitter, Facebook, or Instagram! The world's first nutritionally complete instant ramen. We carefully craft our ramen with 27 vitamins and minerals and more protein than 4oz ribeye steak, all for less than the cost of ordering takeout! Nutritious. Delicious. Fast. Pick three. Ready to get some noods? The store is NOW OPEN! Cooking is great, but takes a lot of energy to do. Fast food is quick, but can make you feel not so great afterwards. If you're already tired or have no time, trying to eat right can be downright draining. Vegan Mushroom Shio, Garlic Pork, and Soy Sauce Chicken. Every packet comes fully featured with a savory flavoring sachet, an aromatic dehydrated vegetable blend, a proprietary Noodtrient™ spice pouch, and an omega-3 rich oil pack. It’s also made right here in the USA to make sure that every ingredient, every nutrient is exactly what it’s supposed to be. With 27 grams or more of complete protein in each packet, Vite Ramen has as much protein as 4oz of steak or 12 oz of tofu! Impossible, you say? Our unique blend of flours includes grains like quinoa to make a robust vegan protein source. Vite Ramen has 3 flavors, with delicious, comforting broths that you can reach for during cold winter days, a bad hangover, or just when you want to feel warm and cozy. Our team of chefs crafted these broths to be just as good the first time as the hundreth. Free ramen, discounts, guides and more! Subscribe to our email list stay up to date on our nood news, stay updated on launch dates and some very special deals and opportunities! Talk with Tim and Tom!